Suspect in Brutal Dallas BBQ Attack Captured on Video: "I Was the Victim"
The suspect who allegedly smashed a wooden chair over the heads of two men in a brutal attack inside a Manhattan restaurant last month is speaking out for the first time through a blog. "I was the victim. People don't realize that. People don't know that," Bayna El-Amin told a blogger in an interview published online earlier this week. Surveillance video of the attack at Dallas BBQ on May 5 shows the two men head toward a front window as the attacker approaches them with the wooden chair. The attacker then flings the chair over his head, and a loud crack and screams can be heard as he smashes it on the victims' skulls. "He was in a rage. It didn't even seem like he was present," said Isaam Sharef, the man who shot video of the brutal attack told NBC 4 New York. "I don't think anybody can watch the video and not be outraged by how horrible this was." 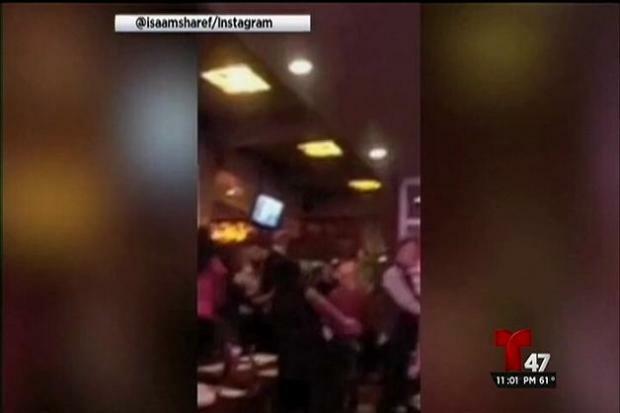 Police are investigating after video was posted online showing a man bash two others over their heads with a wooden chair at a Manhattan barbecue restaurant Tuesday. Brynn Gingras reports. About a week later, police connected El-Amin, who they described as a "career criminal," to the attack at Dallas BBQ restaurant about a week later and said they were pursuing him even as they believed he fled the state. The nature of his previous convictions wasn't immediately known, and it wasn't clear if authorities had an inkling as to where he may have fled. On May 31, a blogger named Waddie G published an interview with El-Amin on The G-List, described as a blog about the author's "love of urban pop, queer and social cultures." The blogger, who's openly sympathetic toward El-Amin, said he spoke to El-Amin with the support of El-Amin's attorney. El-Amin said he was advised from speaking publicly before then. El-Amin, described as an HIV/AIDS counselor and ballroom community leader who's lived in New York City for nine years, told the blogger he was leaving a charity event with friends the night of May 5 when they decided to go to Dallas BBQ. Inside the restaurant, they noticed two men arguing with each other, and the disturbance threatened to spill over to a nearby table where several women were seated, according to El-Amin. "So I said, 'Hey guys! There are ladies here,'" El-Amin said. "I said it in a tone that was authoritative to get their attention. However, they continued." "Moments later, it appeared that Mr. Snipes (one of the two men) was going to leave the restaurant. But by standing at the door, he directed his attention toward me, walked toward me and said, 'And YOU calling us ladies!' And then he struck me. He struck me in the head with an object. I'm not sure what it was, but it felt like a heavy blunt object -- and it hurt," he said. El-Amin said he felt shocked and confused and that he had no idea why he'd been hit, but felt he needed to react quickly before he was hit again. "So I immediately went at him. I got up toward him, and that's where you see the video started," he said. After the chair hit, one of the men lands in a seat and appears to be dazed by the impact; the other man appears to fall to the floor. The assailant, meanwhile, can be seen walking out of the restaurant. El-Amin said there was no provocation on his part, and he never uttered any slur word at John Snipes, who first identified himself as one of the men attacked by El-Amin when video of the assault went public. "He definitely made false accusations and tried to put a crime on me that did not happen," El-Amin said of Snipes. He continued, "I'm 6'6" and roughly close to 300 pounds. Normally when someone sees me stand up, they're slightly intimidated. This guy was not... He didn't back down at all." "My only thought was to facilitate an exit that they would not follow behind us because there was no one there to stop them from doing so -- or pull out a weapon out on us," he said. "There was a chair that's closest thing to me. That's why I threw it. I didn't look it as a way to maim him or use as a deadly force." Snipes had told DNAInfo and other media outlets that he and his boyfriend were attacked "specifically because they knew we weren't their type of people," and that El-Amin had directed racist and homophobic slurs at them. El-Amin said of Snipes' statements: "What was said was line for line, word for word, a flat-out lie." He added: "I can definitely confirm that I did not say anything that was directed towards his race or sexual orientation. As far as what he said, he may have said something [like a slur] to me, but I did not acknowledge that. "I’ve been called a lot of things. And there is no way possible if you know me or my life, I could be called anywhere near a homophobe or anything like that. That is about the furthest thing from the truth about me. El-Amin's whereabouts remain unknown, and it's not clear if he plans to turn himself in to police.